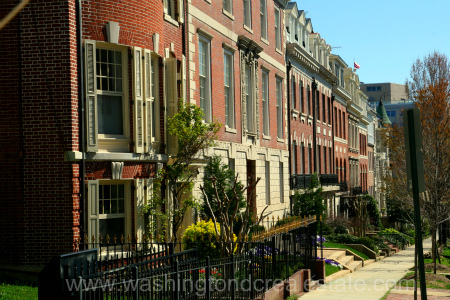 Kalorama is an upscale neighborhood in the northwest quadrant of Washington, DC along Embassy Row. True to its name which means “beautiful view” in Greek, Kalorama is situated on a hill overlooking Dupont Circle with Rock Creek Park on one side. As one of the most desirable addresses in the District, Kalorama is known for single-family estates flanked by embassies, museums, and other landmarks and has long been a center of the Washington social and diplomatic scene. Kalorama also offers the option of living in co-op buildings which take advantage of the elegant surroundings to provide a more urban experience. Read more about Kalorama real estate. Recently rated by Walkscore as one of the most “walkable neighborhoods” in the District, Kalorama offers wide open green spaces as well as a number of historic sites on a typical stroll through the neighborhood. The Woodrow Wilson House Museum and the historic Spanish Steps connecting Decatur Place to 22nd Street are particular favorites. The Kalorama community is divided into two areas – Sheridan-Kalorama and Kalorama Triangle. Kalorama is bounded by Massachusetts Avenue, Rock Creek Park, Florida Avenue, Connecticut Avenue, Columbia Road and Calvert Street. The closest Metro Stations include Woodley Park/Zoo and Dupont Circle.